Welcoming a new baby into the world should be a magical moment shared by parents, friends, and relatives together. But, the first couple of years of a baby’s life are crucial for its development and arguably the most stressful for parents. From sleepless nights to endless hours spent trying to calm down your baby when he or she is crying, everything will be stressful. On the bright side, you’ll also get to buy as many baby presents as possible and decorate his or her room as you please. You’ll also have the chance to look for adorable accessories like strollers or baby bags. Here are our suggestions regarding some cool baby stuff. Specifically designed for cool and elegant mothers, this backpack is perfect for storing your baby’s essentials whenever you are traveling with him or her. It is made of tweed with vegan leather insertions and comes in beautiful shades of white, black, grey, and coffee. The backpack consists of no less than 17 pockets, giving you plenty of space to store everything you need. There are 12 internal pockets specifically designed for bottles, diapers, and wet wipes, as well as five other external pockets in which you can keep your essentials – phone, wallet, and car keys. You can wear it as a backpack or as a handbag thanks to the built-in handle. A mother always has to be prepared with everything necessary for her baby, and this bag is a stylish solution to keep all your child’s essentials in one place. The convertible bag can be worn as a regular handbag, a crossbody messenger bag or as a backpack. No matter your choice, you’ll have easy access to your belongings. The product features a roomy interior with plenty of storage space for diapers, clothing change, milk bottle, and snacks. It also comes with a matching changing mat so you can hygienically change your baby’s diaper wherever you are. This is an excellent product for mothers who want to enjoy the benefits of a true diaper bag without giving up on style. The diaper bag comes in a pretty black and white print that will easily match any outfit. The main compartment comes with a zip closure to keep all your belongings safe and plenty of room to store your baby’s essentials. There are also two mesh side pockets that will fit regular baby bottles so you can feed your child wherever you are. The item is made of BPA-free and Phthalate-free materials and can be worn as a regular handbag, a messenger bag or as a backpack. This simple black diaper tote is suitable for both mothers and fathers and can match your daily casual outfit. It is made of high-quality fabrics that are waterproof and time resistant. You can keep the bag clean by simply putting it in the washing machine. What we liked about this item the most is the large number of pockets providing sufficient storage space for all your baby’s belongings. The bag features no less than 16 pockets, including a large personal pocket, a small pocket for your phone, and six exterior pockets perfect for your baby’s bottles. This beautiful bag is available in a rich grey color and is perfect for mothers who want to adopt an elegant outfit even when they take their kids outside for a walk. It is made of 100% quality polyester and features a nylon lining that is easily washed or cleaned using wet wipes. The interior of the bag is roomy and organized, offering the right amount of space for storing your baby’s diapers, changing clothes or favorite toys. There are also a few external pockets that provide easy access to wet wipes, phone, wallet or keys. The bag comes equipped with two large pockets for bottles. Made out of high-quality polyester fibers, this waterproof wet dry bag is a thoughtful gift for all mothers. It comes with separate pockets for wet and dry clothes so you can enjoy a walk in the park with your children. You can also use the separate compartments to keep the clean diapers apart from the dirty ones. The item is machine washable and comes with a pretty feather black and white design. The large and flexible handle makes the bag easy to be carried around and even hanged on a door handle. 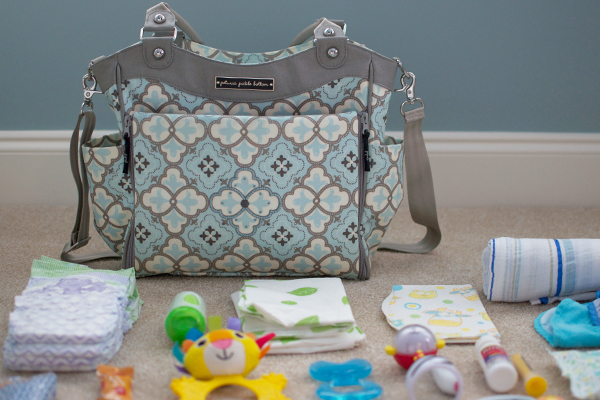 This fashionable and elegant diaper bag can be easily mistaken for your day-to-day tote. It is made of high-quality fabrics and vegan leather and comes in a beautiful color combo of black, white, brown, and grey. The large handle and straps allow you to wear it as a shoulder bag, a backpack or a handbag, depending on your mood and preferences. The interior is equipped with various storage compartments to find everything you need in a matter of seconds. The bag is large enough to hold your baby’s diapers, a change of clothes, bottles, and toys, as well as your personal belongings, including car keys, wallet or phone. Becoming a parent is perhaps the most important event of your lifetime. Not only is it overwhelming, but it is also quite demanding, and in order to make sure that you’re not exceeded and that you can fully enjoy the experience, you need to make sure that you’re getting all the help you need. It’s enough trouble to take care of a newborn baby; you don’t need the stress of having to deal with dysfunctional accessories you bought in a rush because you don’t have the time to properly do your shopping. Although you probably prepared yourself long before the big moment, chances are there’s that one little detail you missed. For example, wouldn’t it be amazing if you had an item you could use for short unplanned trips, that’s spacious enough to fit all the essentials your baby needs and stylish enough to be mistaken for a regular bag? If you think that’s impossible, clearly you haven’t bought a baby bag yet. However, you do not need to worry! We’re here to help you skip the tedious part of shopping, the research, and go straight to the product that you need. We’ve read the best baby bag reviews for you and put together a comprehensive buying guide to help you make an informed choice in the shortest time possible. We now that, especially at this time in your life, every second is precious! Whenever buying baby products, keep in mind that you need something that is, if possible, versatile and multifunctional, extremely portable, and, last but not least, affordable, since you’ll be facing a lot of unplanned expenses. Choosing the coolest bay bags from the countless products on display in shops, online or offline, can become a tricky business if you’re in a rush and slightly confused about what you will be needing to keep up with your life’s new pace. However, if you follow our tips and make a purchase only after carefully assessing your specific requirements, you’ll be sure to get exactly the product you’re looking for. If something is certain, that is after you’ve become a parent, you’ll feel like you’re always short of time. Your life will become a constant rush, and having an item with enough storage space to fit all the other baby accessories you’ll need will help a lot. Size isn’t really the problem here since a lot of producers manufacture bags in large sizes, the thing you should consider is portability. Look for multiple handles, straps, hooks, anything that will help you transport your baby bag or even attach it to your baby carrier. Straps with shoulder pads help increase comfort when carrying a heavy load, while roller baby bags with a dragging handle are definitely easier to carry, but occupy a lot of space and can become uncomfortable in crowded places. Also, keep an eye out for products that can be folded to minimize their size, so that they are easier to pick up. Every baby bag has some compartmentation, but when buying one, look for the ones that have extra compartments with special features. Apart from keeping your baby accessories organized, you can use different compartments to separate personal gadgets from things that might spill and damage them. Or you could use easily accessible compartments for storing thing you need to keep within reach, like your keys or your mobile phone. Look for baby bags with exterior compartments. The waterproof ones are good for storing baby bottles, and in general, compartments that are not connected to the inside of the bag are good for storing food boxes that might spill and stain the other items you are carrying. Keep the inside of your bag available for bulky items, like a stack of diapers, toys or a laptop. The closure system is also important when you have a bag with many compartments. While the major compartments usually have a zipper that ensures security, it’s preferable for the minor, exterior compartments to have a closing system that’s easier to use, especially when you’re in a rush or you have your hands full, like a magnetic flap. Recently, baby bag manufacturers have started to include extra features in their products, at the request of their clients. Keep an eye out for features you think might be helpful, since there are a lot of options and it’s easy to get confused if you don’t know what you’re looking for. Keep in mind that cool baby bags are the ones that best suit your needs, apart from other factors. For example, if you’re an active person and you travel often, it might be helpful to buy a baby bag with an incorporated bassinet and a changing table. Look for one that can be folded to minimize its size and make it easier to carry. Or, if you’re not a fan of the baby carrier, you can always opt for a backpack-style baby bag, with a harness attached to the front straps in order to help you carry your baby as you walk. Needless to say, if you’re a hopeless fashion addict, there are a lot of designer baby bags out there to match your sophisticated preferences. Parenthood is always going to be fashionable. The most important aspect of learning how to be a good parent, apart from the worrying, the impulsive shopping and the sleepless nights, is to manage to enjoy the time you spend with your newborn. Choosing the best baby products to help you in your new adventure is an essential part of alleviating your work during the first years. However, in this day and age, it’s easy to get lost among all the products manufacturers, and designers have to offer, and it’s even easier to find yourself in financial difficulty during the first few months. If you follow our rules, you think ahead and prepare yourself long before the crisis strikes, and, last but not least, if you know your needs and requirements and those of your child, there’s no way you can make a wrong choice.